Slipscreen GS/A_LC is the comfort solution for off-road and hot weather riding when minimal physical obstruction and maximum airflow are a comfort advantage. Slipscreen is easy to swap with the stock windscreen using just two existing screws. 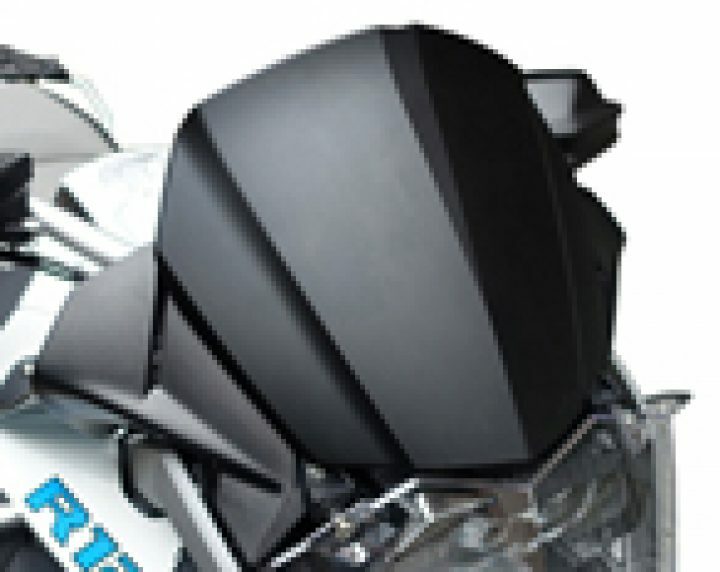 There are no front surface fasteners for a clean look and it's appearance reflects the GS's angular styling. When cold weather returns, the swap back to the stock screen is equally easy with just two screws. Slipscreen is precision injection molded and available in Black or Granite Grey Metallic that matches the GS's tank panels. The height adjustability feature is retained, covering the Navigator GPS unit in its low setting while extending 2.5" above it in its highest position. GS off-road riding schools instruct students to "look up - don't fixate on the front end". At 10.5" tall, Slipscreen's size is unobtrusive while its opaque color encourages keeping eyes looking forward, not down. How many units? 8 units in stock.